There are many different ways to brunch. For example, there are classy brunches, foodie brunches, healthy brunches, and low-key hangover brunches, all of which are lovely. However, when you want to start your day off on a bit of a rowdy note, there’s the party brunch. When WHA stopped by Fresco’s Cantina on an icy Sunday in January, we were treated to one of the most enjoyable party brunches we’ve experienced in awhile. 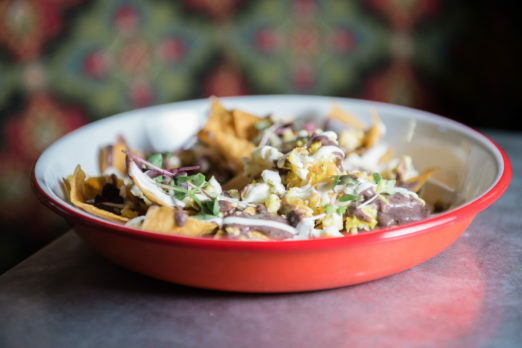 We’ve visited Fresco’s before to sample their dinner menu, and have always been pleased with their laid-back atmosphere and playful take on Mexican fusion. Purists might raise their eyebrows at items like chicken wings and burgers at a Mexican restaurant, but they’d be missing the point: this is a super fun spot to gather friends over a few drinks and some tasty bar food. Speaking of drinks: their brunch deal is pretty sweet. You see those carafes above? 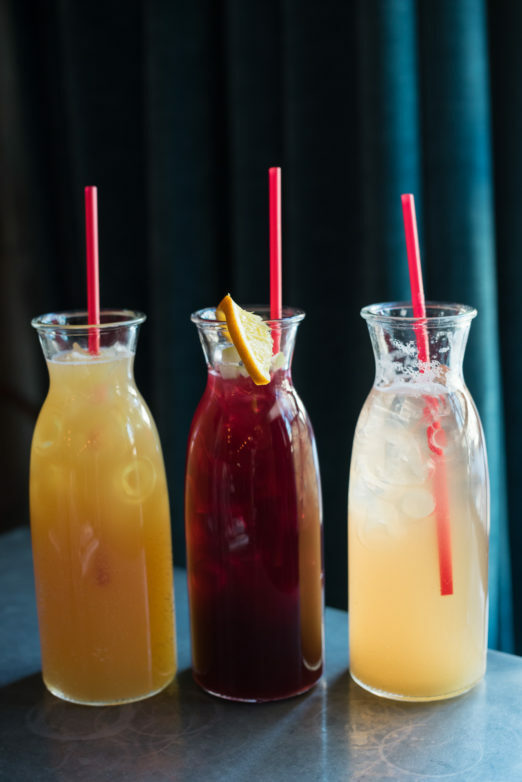 For $35, brunch patrons receive one entree and one entire carafe of sangria or mimosa, which is pretty much the perfect amount to enjoy the proper brunch buzz. (Full disclosure: I am participating in Dry January, so I am relying on the bubbly good time my brunch pals Emily and Marielle were having after enjoying these brunch cocktails!) They sipped on sangria, pineapple mimosa, and standard orange mimosa, and were delighted with all three. If you’re like me, you’ve never met a quesadilla you didn’t like. 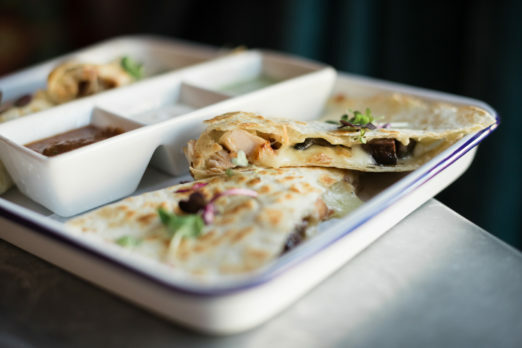 Fresco’s brunch offering is aptly titled the Hangover Quesadilla, and it’s stuffed to the brim with steak, chicken, pork, and a three cheese blend. This is a great option for an entree, or to order for the table to be shared. 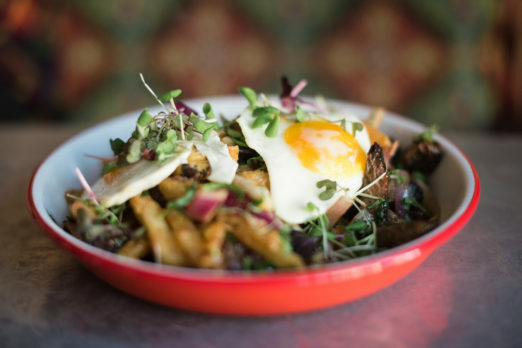 My favorite dish of the brunch was Lomo al Caballo, a Peruvian stir fry of skirt steak, french fries, onions and tomatoes topped with a runny egg. It was salty, meaty, and carb-y, pretty much everything you could ask for! Next up, the straightforward but satisfying Breakfast Burrito. 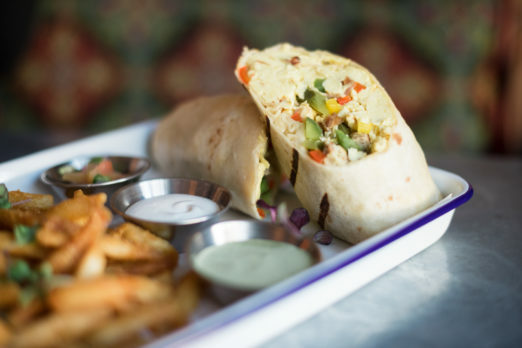 Wrapped up in a flour tortilla you’ll find scrambled eggs, crispy bacon, sausage, peppers, onions and cheese. And this is gonna sound crazy, but those fries they serve with it were excellent. Now for something sweet! 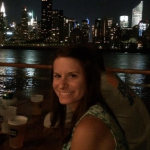 Marielle and Emily loved the Mexico City on their most recent visit, so I just had to try it. 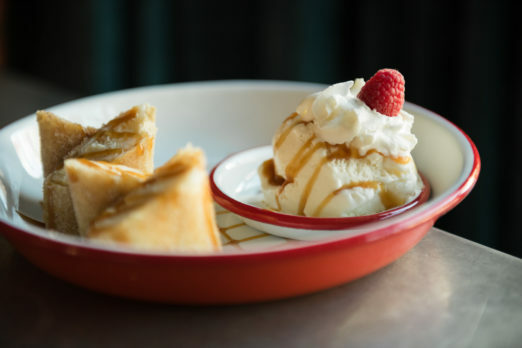 The delectable creation is a churro-style egg roll with a banana caramel cheesecake filling, served with a scoop of ice cream. If this sounds delicious reading it, just know that it tastes just as wonderful! As I mentioned before, brunch at Fresco’s is a PARTY! 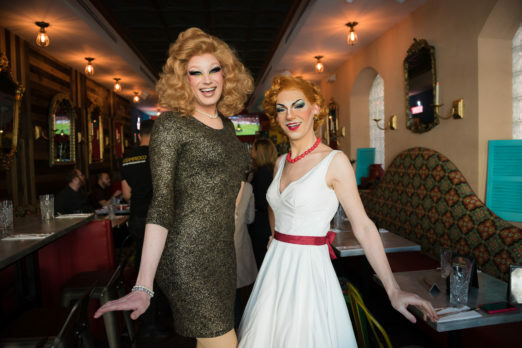 Hosting the festivities were fabulous drag queens Golden Delicious and Gloria Swansong, who kept the crowd captivated throughout brunch. 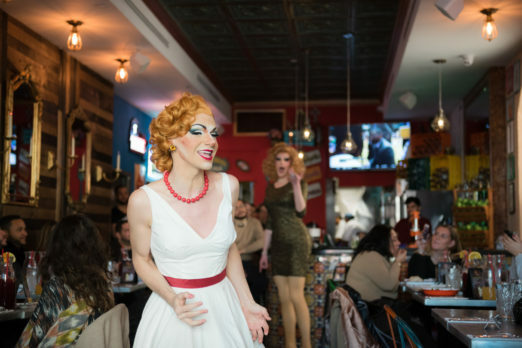 Their performances to everything from Justin Bieber and Scissor Sisters to Rent, Wicked, and Frozen had all of us brunchers laughing, singing, and dancing along. Seriously, look at how awesome they are! If you’re looking for a brunch that’s a rollicking good time, make the walk to Fresco’s Cantina. I can’t wait until Dry January is over to try those mimosas! This post was sponsored by Fresco’s Cantina. Thank you for supporting the businesses that support We Heart Astoria!